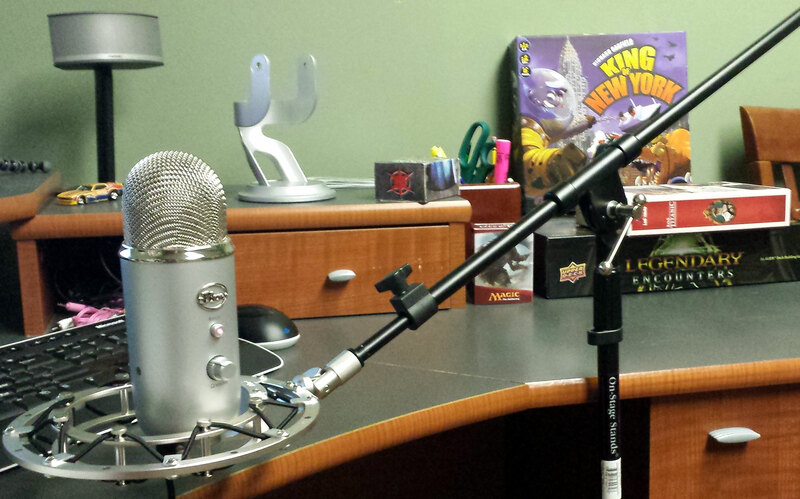 Click here to listen to me talk about the game on The Dukes of Dice Podcast: King of Charity. I was fortunate enough to get in a charity auction bidding war with a gentlemen by the name of J. Thomas Lowell, for a chance to be a Duke for a Day at The Dukes of Dice Podcast. The short of it is he won, but I went ahead and donated my high bid (as second place) since it was for a worthy cause (Jack Vasel Memorial Fund). J. Thomas Lowell graciously suggested that we both get a shot at being Duke’s for a Day and Sean and Alex from the podcast agreed to the idea. I had a blast and am very grateful for the opportunity. Please check out the Jack Vasel Memorial fund (and consider a donation), listen to the Dukes of Dice podcast, and take some time to read J Thomas Lowell’s blog (www.thepiquer.com). 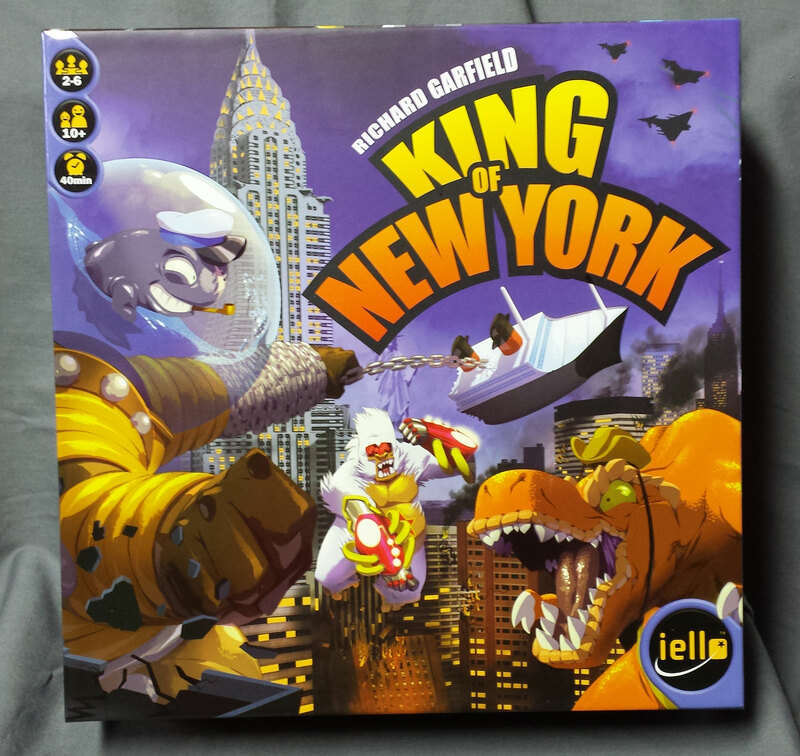 For this month’s installment of The Soundtrack Of Our Dice, we are visiting King of New York, the follow-up to the 2011 hit board game, King of Tokyo (Both from Iello Games). 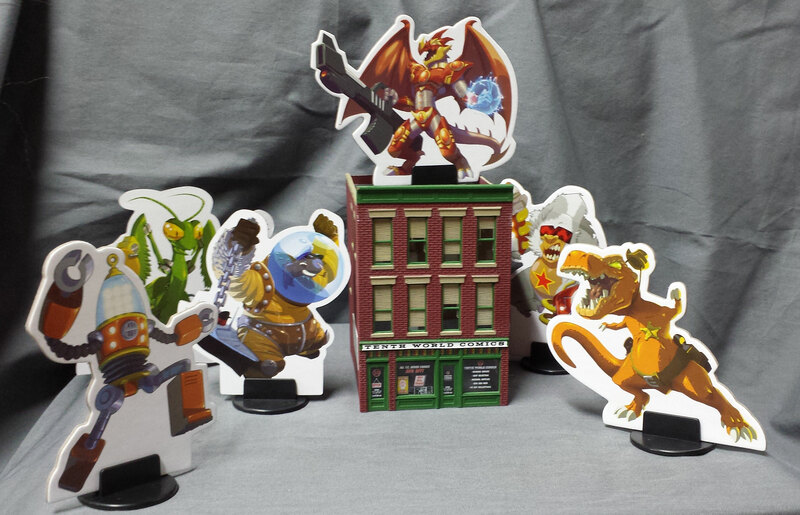 When King of Tokyo was released, it was very popular among gamers for its great theme, superb artwork, and fun game play. It remains one of my favorite games for many of the same reasons. I love the artwork (check out the card, Jets), the game is fun to play and really easy to learn. It’s one of my go-to games for people new to the hobby and is the first game in my suitcase when we travel. King of New York sustains, if not exceeds, the level of quality regarding game play, theme and artwork (check out the Stomp and Jinx Aura cards). The game is not really a sequel, so much as the second game in a Mutant-Monster based series, if you will. I say that because, while it keeps most of the core elements of King of Tokyo, it feels entirely different. In both games you roll dice Yahtzee style, resolve the symbols on the dice, and either race to 20 victory points or bash your monster opponents into submission, being the last monster standing. In King of Tokyo, most of the game was played by resolving the dice, either attacking or gaining victory points. Aside from a special card, in order to get victory points in King of New York, you have to move around New York, from borough to borough, crushing buildings while avoiding retaliation from military units. Make it to Manhattan, and you get bonus victory points and energy (used to buy power up cards), but watch out, all the other monsters will be out to get you! All of the in-game mayhem makes for a superb night of gaming with the family or friends! It most-certainly needed a soundtrack to go along with the destruction. 2. The Ramones – Howling At The Moon (Sha-La-La): Straight out of Queens, The Ramones were considered punk rock, but there was actually a good deal of melody in a lot of their songs. Howling At The Moon is a fine example. 3. The Talking Heads – Life During Wartime: Chris Frantz’s driving rhythm and the ominous, yet lively tone of this song will motivate you to stomp buildings and eat jeeps. If you are not a Talking Heads fan, watch their concert film, Stop Making Sense. You will be after (the clip below is from the film). One of the best concerts on celluloid and a true representation of the art and music that they created. This ain’t no party, this ain’t no disco, this is King of New York! 4. Billy Joel – Rosalinda’s Eyes: You know what, maybe it doesn’t fit…but damn, it’s good. 5. Beastie Boys – No Sleep Till Brooklyn: I bought License To Ill on January 1, 1987. My best friend and I drove around town playing the tape over and over. Kerry King from Slayer is on guitar duty for this track and the video pokes heavy fun at hair metal (with maybe a jab or two at Gene Simmons from KISS). Close your eyes and imagine Sheriff plowing his way down to Brooklyn while humming this gem, flailing his tiny arms to the beat. Paul’s Boutique, their follow-up record, remains one of my favorite records of all time. Just in case you were curious. 6. Blondie – Rapture: This was a cool song then, it’s a cool song now, and it will be a cool song in 20 years. They were regulars at CBGB’s, along with The Ramones and Talking Heads. “…Then when there’s no more cars, you go out at night and eat up bars, where the people meet.” Try not to smile when that part of the song hits your ears while your eating a jeep or knocking a jet out of the sky. 7. Red Fang – Prehistoric Dog: This song has massive power. Need a workout playlist? This song. Repeat. Done. Fantastic video as well. The Wizard practicing his fireball in the background is hilarious. They give a huge nod to Monty Python’s, The Holy Grail. 10. Tom Waits – Coney Island Baby: As you trample your way up Manhattan, you can serenade the gal (or guy) that you just pulled out of a window with this song. Hey, you can’t sing any worse than Tom Waits, right? At first I thought I was stretching a bit with this song, but after a couple listens, it felt just right. 11. Ryan Adams – New York, New York: We can’t let New York think we don’t love it, right? This song, off the record Gold, is the beginning of a near perfect album. Start to finish the whole record pulls you in with beautifully written songs and arrangements. Unfortunately, this album was so good, it led Ryan to believe that everything he jotted down on a napkin should be recorded. If you buy this record, look for the deluxe edition with the bonus disc. Well worth it. I think I’m going to go listen to it now. Err , were the hell is , King of New York by the Fun loving criminals…. ?